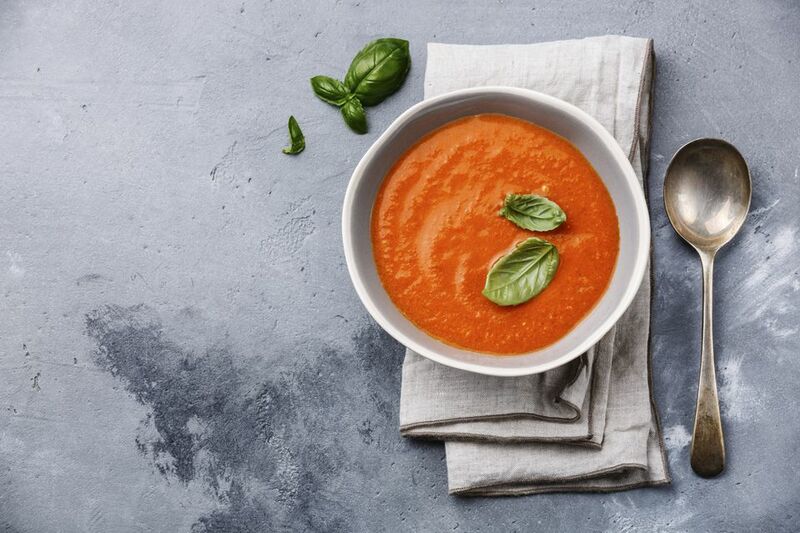 Tomato soup is a classic in almost all cuisines. Germans are accustomed to serving it with unsweetened whipped cream on top to make Tomatencremesuppe. The cream slowly melts into the soup, making swirls of creamy, tomato-y taste without too many calories. This soup can be served as-is, with basil, or some shaved Parmesan. To make this a vegetarian soup, use vegetable broth as a base. While Roma tomatoes, also known as Italian plum tomatoes, are the best to use, any tomato will work. You also can substitute the whipping cream for sour cream if you want to give it a little more bite. If you want to make this recipe vegan, you can substitute the cream for silken tofu, by whipping it until smooth. Using tofu may require some taste-testing to ensure the flavor is how you want it, and you probably will use less tofu than the amount of cream called for, but it should give you the same creamy texture as the traditional recipe. Heat 1 teaspoon good-quality olive oil in a skillet and sauté the 1/2 cup chopped onions until translucent. Add 1 clove chopped garlic and continue to sauté for a few minutes, being careful not to burn it. Add the 1 pound of quartered tomatoes, toss in the 2 tablespoons vodka or tequila and the herbs, cover pan and cook for 10 to 15 minutes, stirring occasionally. When tomatoes are soft, remove from stove and place contents in a blender. Carefully place one or two hot pads on the lid of the blender and hold the lid in place while you blend the hot tomatoes for 30 seconds, or so. Pour the sauce through a sieve over the pan and, using the back of a spoon, coax all the liquids back into the pan. This step is optional but results in a smooth and flavorful tomato soup. Add 1 cup of chicken broth or vegetable broth, salt, and pepper to taste. Heat gently for 5 minutes. Ladle into bowls and garnish with a dollop of unsweetened whipped cream and chopped basil.